WHAT LED THESE WANDERING JEWS TO BENIDORM? Vera Helena Lobel Divoyra was born and brought up in Sao Paulo, Brazil. Her shoemaker father left Poland in 1930 in search of a better life for his family and he was able to send for his wife and young son, Andre, two years later. Helena was the second daughter born to them in their new country. Times were hard and father, Leibus, continued to make and repair shoes, whilst mother, Shifra, sold clothing and other goods from door-to-door, collecting payments monthly. By the time Helena was 18, family fortunes had improved and her parents owned a furniture shop, where Helena worked. One day a salesman called at the shop and decided this beautiful young lady was the perfect partner for another of his customers; and so, without Helena’s knowledge or agreement, a plan was hatched for the two young people to meet. The plan worked well and at the age of 20, Helena married Harry Agaton, a Rumanian who had found his way to Brazil via Italy. Harry never lost his wanderlust and love of Europe, and through wise investments in property, was able to take very early retirement in 1966. He took his wife and two young daughters on an extended 8-month tour of Europe, covering some 32,000 kilometres. Amongst the many places they visited was Vienna, where Harry caught up with old friends, and Harry decided he would like to settle there. It took him two years to persuade Helena to leave her parents, brother, sister, aunts and uncles in Sao Paulo and move to Vienna, where they lived from 1968 to 1973. During those five years they continued to travel frequently, spending the summer holidays in Spain, where they fell in love with Benidorm. In 1970, they bought their first apartment in Benidorm and used it every year, eventually deciding to move there permanently. They bought more apartments and set up business renting them out and administering other people’s properties, which business Helena continues to this day. 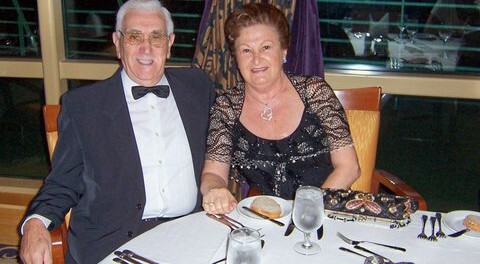 In 1991 Harry passed away but Helena had no intention of returning to Brazil, although her daughter Elaine and her surgeon husband Silvio live there with their daughter and son. Helena and Leslie visit them, and her brother Andre and sister Fanny in Sao Paulo every year. Helena’s other daughter, Sandra lives rather nearer, in Almeria, where she runs a language school, specialising in English and German. Sandra has three grown-up children, two lawyers and a student. And now to Leslie – his father, Solomon, a tailor, left Bialystok, Russia, for Sheffield, as a boy of 14 in the 1880’s; his mother, Lily, was born in London, but lived in Liverpool from an early age Her parents came from Riga in Latvia: Leslie’s parents married in 1917 in Liverpool, in which city his father then resided. Leslie was born in Salford and grew up in Manchester, commencing his secondary school education at Burnage High School in 1935, which was evacuated to Wirksworth in Derbyshire a couple of days before the start of war in September 1939. When the anticipated air raids on Manchester had not occurred by April 1940, the school returned to Manchester, but later that year large scale air raids on Manchester did commence and the school suffered two direct bomb hits. He commenced work at the age of 16, with the Dunlop Rubber Company in their Physical Testing Laboratory, later working for Thomas French & Co in their Chemical Laboratory. During the war both companies were engaged in the manufacture of products for the armed forces. Leslie started a part-time Chemistry course at the then Manchester Technical College, but due to the possibility of air raids, evening classes had been suspended and were held on Saturday mornings instead. At the age of 18 Leslie was called up into the Army in June 1943. After 6 weeks basic training, he joined the Royal Corps of Signals. In June 1944 he took part in the Allied invasion of France, landing on Utah beach in Normandy, along with the RAF unit and the unit of the U.S. Army Air Force to which his Royal Signals Company was attached. He served in France, Belgium, Holland and finally in Hamburg, Germany from May 1945 to June 1947. The Royal Signals provided landline communications for the RAF throughout the whole campaign. By the time he left the army he had attained the rank of Corporal. On return to civilian life, Leslie resumed work with Thomas French & Company, and in1949 obtained a job as a laboratory assistant with the Swiss Chemical manufacturing company, Geigy, at their factory in Trafford Park, Manchester. He qualified as a professional chemist on completion of several years study in inorganic and organic chemistry, at the Royal College of Advanced Technology, Salford. Leslie continued to work for the same company (later re-named Ciba-Geigy) until he retired in June 1986 – a total of 37 ½ years. In 1953, Leslie married Lena, who he met in Liverpool at a cousin’s wedding. Lena and Leslie had no children and when Leslie retired at the age of 62 they decided to move to Bournemouth, where they lived for five years. Another cousin inspired them to move to Spain, where, after some exploration, they settled in Javea. They discovered the Jewish community based in Benidorm, which was already holding monthly lunch get-togethers. So when Lena sadly passed away in November 1993, Leslie knew where to turn for help. Lena’s was the first funeral to be held in the newly-acquired cemetery and as such made the local newspapers. But Leslie had great difficulty in arranging a headstone for Lena, and so he got in touch with Margit Cohen, in the hope that she could help. Margit spoke no Spanish and suggested that Leslie contact Helena. Helena, of course, offered to assist in dealing with the stonemason and the Ayuntamiento in Benidorm, and the memorial stone was obtained. Helena and Leslie continued to meet at Community social functions. Eventually, in October 1994 the quiet, nervous Leslie decided that he would like to ‘date’ the feisty, but equally nervous Helena, and she finally agreed to go out to dinner with him. He assured her that he wanted companionship, not a housekeeper. And so their courtship progressed. Leslie still considers himself extremely fortunate that Margit was unable to speak Spanish! They have now been married 17 years and it is impossible to imagine one without the other. They are both very busy people, deeply immersed in their devotion to the community: Helena is Vice-President of the Board and serves on several sub-committees, as well as acting as unofficial translator on behalf of members of the Community; Leslie is Helena’s ‘Personal Private Secretary’ and official photographer to the community and still finds time to organise every detail of wonderful trips around Spain for members of the Shul. Where do they find the energy? We can all only admire and respect them – may Helena and Leslie continue to be an inspiration to their many friends ‘until 120’.